Are you planning to go to Versailles? Visiting the palace of France’s famous Sun King? Be prepared to be surprised then. It could well happen that you get on a train that looks like the library of Louis XIV…or like the bedroom of his wife Marie-Antoinette. No kidding! Is it an optical illusion, you might wonder, a mirage? Not at all. Let’s call it a very royal makeover instead. 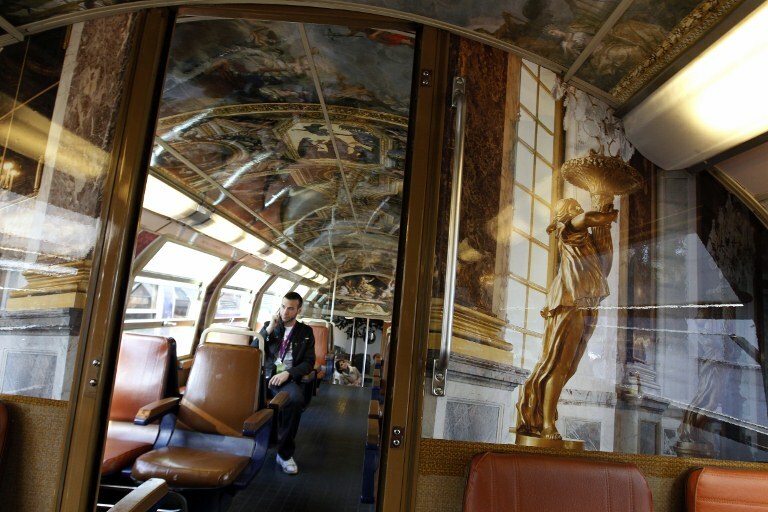 A handful of commuter trains connecting Paris with Versailles have actually been decorated in the colours of the Château de Versailles. It’s a bit of a French Folly. But it’s made to please the many people traveling on the regional train RER C, most of them tourists anyway, an estimated 50000 a day. From the outside the train doesn’t look much different than its shabby counterparts. But once inside, you won’t be in any doubt as to whether you got on the right train or not. Because the trains, all about 15 to 20 years old, have got their ceilings and walls decked with images of famous rooms of the chateau. The Hall of Mirrors? It’s already here! The famous Gardens? You won’t smell any flowers, but are invited to admire the view. To make tourists even happier, the Versailles office of tourism and the SNCF, the society running the trains, has sent out about 15 hôtesses to help and assist tourists on theirway to Versailles. Theses Gauls are crazy? Yes, but don’t complain. For once they treat you like a guest!